ROAD TOWN, Tortola, VI – Patsy C. Lake, businesswoman and local activist, during a press conference with other organisers of the national march on May 17, 2018 at the Sunday Morning Well, strongly expressed that if the march, scheduled for May 24, 2018, was politically motivated she would not support the march, while admitting that she never thought she would need to march again. Mrs Lake was involved in the Positive Action Movement march in 1968 in protest of the Bates-Hill Company’s unfair development of land within the territory. 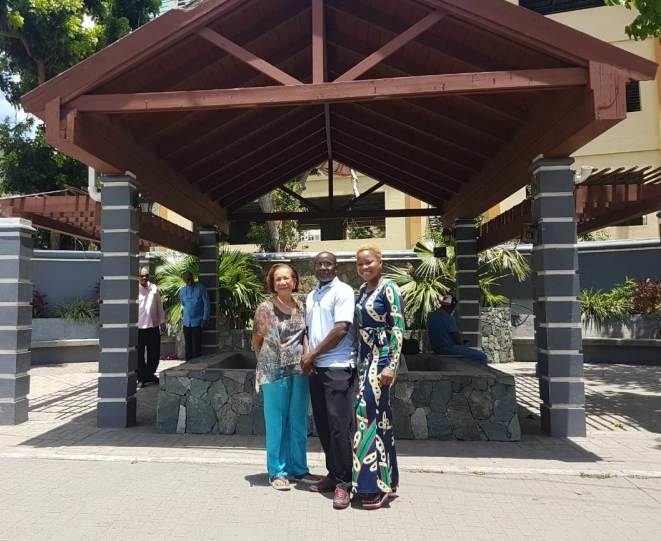 While encouraging persons to come out and support the march, Mrs Lake mentioned that the expatriates should support the march as well because they will be affected as well. “Those of you who have come here to make a living, if we don’t march and this goes through you will have to go back to your country or find somewhere else to reside. It’s just simple. We are going to sing during this march, ‘We Will overcome’ because in this day and age you can’t just cut us off and push us back forty plus years and this is what this is all about. Don’t let the negative persons stop you from taking part in this. This is your future,” she added. Meanwhile, Bishop John I. Cline, who is spearheading the organising committee, expressed that Governor Augustus J. U. Jaspert's absence will not affect the march, while explaining that his trip was planned before the decision to have a march. Bishop Cline further stated that the petition will be given to David D. Archer Jr, Deputy Governor, who will then pass it on to the Governor to hand to the UK. 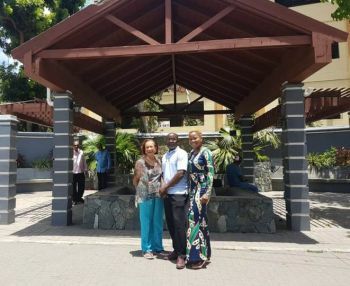 Businesswoman and Mrs BVI 2017, Zoe J. Walcott-MacMillan, who is another member of the organising committee, assured public servants that they will “not be penalised” if they decide to march. 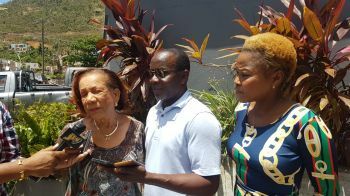 She also told reporters that chartered ferries will be made available for persons from the sister islands who wish to take part in the march. 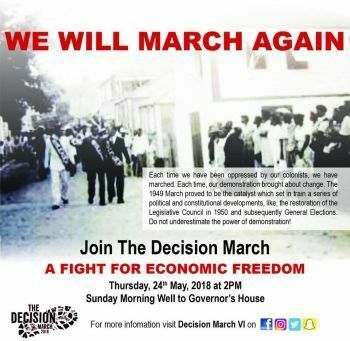 The march is scheduled for May 24, 2018, starting at 3:45 P.M. to facilitate the public servants and it will begin at the Sunday Morning Well, to Fleming Street and Waterfront Drive and end at Government House. The march is in protest of the UK parliament’s recent vote to impose public registers, which is an amendment to the UK’s Sanctions and Anti-Money Laundering Bill, that forces the Overseas Territories and the Virgin Islands (VI) to reveal names of beneficial owners of offshore companies registered in the territory. Patsy C. Lake, Bishop John I. Cline, Premier and Minister of Finance, Dr The Honourable D. Orlando Smith (AL), Opposition Leader and First District Representative Hon Andrew A. Fahie (R1) and Deputy Premier, Dr The Honourable Kedrick D. Pickering (R7) will be the speakers at the march. We have been quiet for too long. She’s is correct, this march is for us, the people and not any certain party. Thank you Mrs Patsy Lake for joining in our struggle once again at your graceful age. A lot would not know what this March signified because history is always told backwards. Smoke and Mirrors. How convenient it is that the Governor wouldn’t be here, that’s diplomacy for you. Some words are meticulously measured and hardly hold weight in the diplomatic chess game. However, what most critics do not understand is that, this is a demonstration of the seen and the unseen. The Spirits of the Ancestors will be in our midst. This will be a March of all Marches protected by the blood and tears of our Ancestors to send their message of solidarity where there are treats of devastation by outside forces who are so willingly eager to destroy our very existence as a people. Sacrifice. Politics can come after. This is about survival of our people for the next generation. Some will not understand it’s purpose today. Thank you, Patsy. You are a living testimony from whence we came and had to overcome. May you continue to be blessed. The March will go on and we are confident that the our deputy governor, Mr. Archer, will handle this situation with much grace. This is a sign of Divine Intervention at play. @Tears. We are being “threatened” by outside forces for real. This time by our alliance who supposedly helping us. If they pass that bill, we will be crushed. March for the Sewerage and effluent daily polluting our undeniably 1st class road-network. Hope ayo marching down Main St. cause if another Bellagio fountain erupts during the march ayo get what the duck got.....oops! March for the toxins down on the Western side of the island. The March is good but we are too divided at this stage to accomplish much. Everything in the VI is about politics so of course the March is political. If you believe this is a worthy cause and it is, just march as you did with PAM. Noel Lloyd and PAM agitation was political. NDP and VIP elected are publicly supporting the March so it is political. Wish it were just a people march but politicians are in the forefront. Government should be working the diplomatic channels to make the case for reversal of the vote.